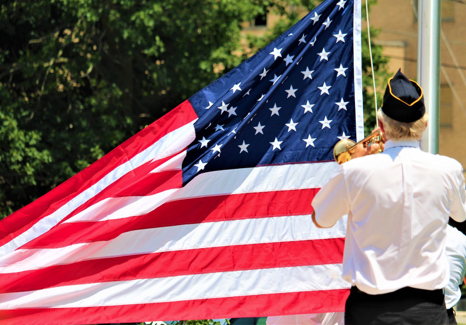 On July 4, Grinnell veterans raised a flag over the Veterans Memorial Building. Five days later, the Veterans Memorial Commission, at its regular July meeting, raised expectations that two upcoming reports will move Grinnell closer to establishing the Prairie Star Artist Residency in the Veterans Memorial Building. Commission Chair Leo Lease called the meeting to order at 5:15 p.m. on July 9. All commission members attended; six people made up the audience. The current meeting agenda and the minutes of the previous meeting were approved unanimously. Nicole Brua-Behrens of the Greater Poweshiek Community Foundation cited two balances. The first, $12,469.64, aligned with agenda item 3, “Monthly budget report.” The second amount, $33,393.00, is the sum raised to date as recorded by the foundation. The commission approved one bill for payment: Alliant Energy, $90.98. Under agenda item 6, “Update on Amperage Marketing & Fundraising,” Tom Lacina reported that the firm has asked to present survey results at the commission’s next meeting. He feels that the survey is nearing completion and that Amperage personnel will use the time between now and the next meeting to compile results and make recommendations. Lease called for adding that matter as an agenda item next month. “And then we’ll know one way or the other,” he commented. Contract negotiations with RDG Architects are underway, and a first draft contract is in the works, Lacina added. Cost estimates and initial renderings will be part of the firm’s preliminary work. Lease mentioned that the commission is “very much indebted” to Russ Behrens, City Manager, for serving as contract negotiator. The commission approved the city manager for that role at its June 11 meeting. Also approved at the June 11 meeting was designation of the Grinnell Area Arts Council “to develop an organizational and operational framework for the Prairie Star Residency as a proposed future occupant of the Grinnell Veterans Memorial Building.” Lacina advised the commission that the Arts Council would meet the third Monday of this month (July 16) from 6:00 p.m. to 7:00 p.m. Discussion followed concerning whether a commission member can attend the meeting; Lacina said yes and added that doing so could prove valuable as commission representatives might be able to answer questions from the Arts Council. During the inquiry session of the meeting, Tom Lacina offered a recap and a timetable. Next month, he said, will represent “a potential handing off of the baton.” Amperage Marketing’s researchers will complete their report. Architects will also likely have a contract ready for approval. In both cases, the next step is fundraising. He also stressed the importance of volunteer participation. Amperage will assist, accompany, and coordinate, but committed community members must drive the campaign. “The work is just beginning,” Lacina commented. Regarding the August meeting, some commission members reported conflicts with the regularly scheduled date of August 13. In fact, discussion revealed that a quorum could not be present on that Monday. Lease suggested a motion for a special meeting on Friday, August 10, at 5:15 p.m. Although not all commission members will be able to attend that session, a quorum could be present. The motion, moved and seconded, was passed. Prior to meeting adjournment, Randy Hotchkin noted that Iowa Congressman Rod Blum had recently paid a visit to Grinnell. Although not much notice was given, Tom Lacina, Russ Behrens, Duane Neff, and Terry Stringfellow were able to attend with Hotchkin. The group toured the Veterans Memorial Building and Central Park. Congressman Blum referred Grinnell’s representatives to a successful building campaign in Waverly, Iowa, the county seat of Bremer County, north of Cedar Falls and Waterloo. Waverly is roughly the size of Grinnell. After flood waters in 2008 destroyed the town’s AMVETS building and damaged the Legion building, the AMVETS, the Legion, the VFW, and the Marine Corps League came together to conduct a drive for a new building at a cost of $4 million. Waverly dedicated the building in October of 2016. Hotchkin expressed the hope that Grinnell representatives might be able to learn from Waverly’s successful drive. The meeting was adjourned at approximately 5:37 p.m.
Next Grinnell Area Arts Council is pleased to announce the addition of Monica St. Angelo as our new Operations Manager!